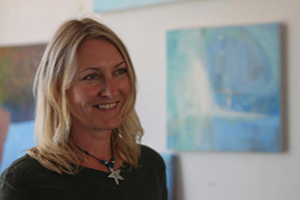 Krista has lived in Cornwall since 1984 when she moved from Lancashire to complete her studies at Falmouth College of Arts. Her work has ever-shifting influences which keeps it fresh and moving: Remembered images and places; impressions and atmospheres; origin, choice and destination; shame and compassion; subconscious wisdom; love and humour. Painting in acrylics and oils her work is at once bold and personal, abstract and figurative. She has a fascination with colour and is not afraid to introduce intense brightness to an intimate scene. Krista's large canvasses and stunning use of colour offer a spectacular framework for her exploration of the human form, in which she focuses on the female figure, and more recently landscape based pieces. Galleries interested in her work may contact galleries@kristataylor.com.